Jeremy Corbyn began PMQs with the Surrey council controversy, which first appeared a month ago when the Labour leader ambushed Theresa May with leaked text messages suggesting the local authority had been offered a “sweetheart deal” to halt a referendum on raising council tax to fund social care. With a recording emerging which appeared to confirm that there had been some sort of backroom deal, it always seemed probable that Corbyn would follow up on one of his better performances. May’s responses were lawyerly, trying to wriggle away from Corbyn’s question and look like she was dealing with the specifics by providing plenty of superfluous detail on business rates. She claimed she had already answered that there was no special deal for Surrey. “The business rate retention pilot will be coming into force for a number of councils this April, that includes…Liverpool, Greater Manchester, Greater London and some others,” May said. Her dry-as-dust answer meant May was able to frame the discussion as merely a debate around how business rates are enacted. 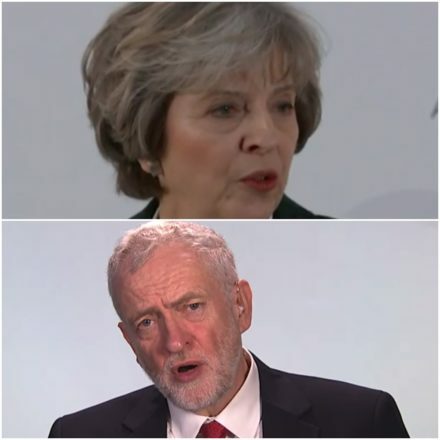 Corbyn looked unable to alter his questioning when be received an answer he seemed not to have expected and, whilst he had the stronger ground in the debate, the devil seemed to be in May’s detail. It is irrelevant of course, that the metro mayoralties and London are being offered this provision – to retain business rates raised in their area – when the only other place where this is offered is apparently Surrey. This next step of probing, to focus on why a Tory county council – entirely different to the mayoral areas – have been given this convenient opportunity, was unfortunately not taken up by Corbyn. And also, does anyone actually believe that the “gentleman’s agreement” Surrey have been offered is just that they can keep their business rates raised? Pull the other one. The Labour leader then moved the discussion on to schools, with the Tory obsession with new grammar and free schools coming at the expense of classroom places where they are needed. Corbyn described them accurately – and scathingly – as “vanity projects” amid “soaring” class sizes” – but this was again something where May’s existing lines, which we’ve heard before, could be used as a full response. She painted the funding as providing “choice” for parents and said her aim was not merely to provide any school places, but “good” school places. Her lines were weak – but Corbyn’s attacks were insufficiently honed and gave her the space to repeat them. She isn’t winning points for originality, but Corbyn wasn’t pushing her to say anything new. Labour backbenchers also touched on education, with Julie Cooper asking about why there are millions of pounds for grammars whilst other schools are seeing their places squeezed. May’s answer was weak, again just listing the choices of schools that the government is creating. Yasmin Qureshi asked about early years education, and why so many nurseries are facing budget pressures – which she could even force them to close. The PM sidestepped the question altogether – we are getting used to this – and focussed on the apparent achievements of Conservative government, saying that they have increased childcare provision, given greater help for those on low incomes with childcare costs and introduced shared parental leave. This seemed pretty irrelevant to Qureshi’s question. Dan Jarvis asked about the memorial being unveiled tomorrow for those who lost their lives serving in Afghanistan and Iraq, stressing the need for the prime minister to do more to ensure that the right lessons are being learnt from the conflict. Jarvis, a former paratrooper, is of course well placed to urge this, given his record of service in the wars, and May would do well to heed his advice. Overall, this was a PMQs where more could have been done by Corbyn, but where the prime minister was also unable to score a clear win. With more focus on May’s evasiveness, and a more agile reaction to boasts, the Labour leader could prosper.